There are so many iOS games out there and most of them really just don’t do it for me, they don’t force me to strive to complete the game nor do they keep me around long enough to truly appreciate it but every once in a while a game comes along that blows the others out of the water and truly impresses me. Straight out of the gates I have to say that Joust Legend is one of those “primo” titles. 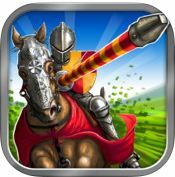 You’re a low-level knight that is knowledgeable in the art of jousting and the whole aim of the game is to build up your character and win the King’s Tourney. It’s so simple of a premise yet it hasn’t been done before, at least not to this calibre. I don’t want to give too much away in the first paragraph of this review so read on to see what exactly I liked about this game. Joust Legend has a bit of a difficult style of gameplay that has you struggle against both your horse and the strength of your knights arm. Let me take you through a typical joust: You start of on your horse is it, kind of, “idols” at the beginning of the straight, it jerks back and forth and a bar appears below it which continues to fluctuate, your job is to press down on the screen and struggle with the horse until the bar hits a green glow which signifies a perfect launch. The amazing thing about this is that, even though there is no rumble feature, it feels like you really are struggling with a horse. 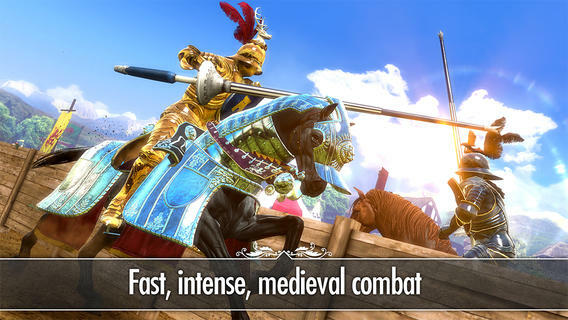 Next up is the run and contact: A bar will appear to the right of your character who is now in motion, there’s an indicator on the top of the bar that shows how far away you are to the enemy, you swipe down and your knight will lower his lance, the aim here is to keep your finger on the screen and try to sync up to either the “Body Contact” are of the bar or the “Head Contact” area of the bar, obviously the head being the harder to hit. You get special bonuses for doing special things like making contact with the crest or the head and you get an even bigger bones when you break your lance. The gameplay is fantastic and it actually feels very rewarding. There are four different game types to choose from so you never really run out of things to do and if one gets boring or too hard you can just swap out for the time being and try another style of game. Practice, Prize Fight, Wager and King’s Tourney are the four types you can choose from and they’re all pretty self explanatory. 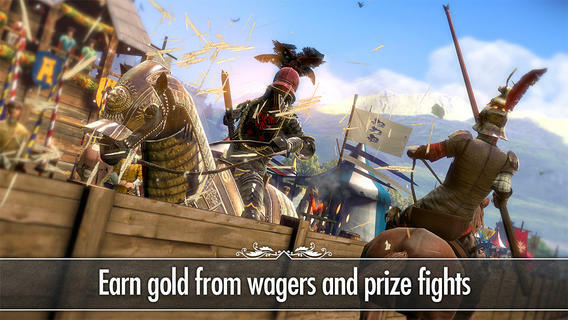 Prize Fight is where you earn power-ups to use in any of the game types and Wager is where you go to, primarily, earn the big bucks to you can customise your knight and horse. 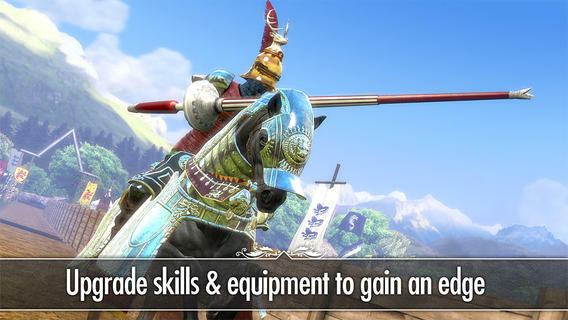 Practice is practice and the King’s Tourney is the main part of the game where you go up against other high-level knights. There’s so much to do and earn and also so much to unlock. The thing I like most about this game is that you have to learn to get good at it, it doesn’t just put it on a silver platter for you and you’re expected to just win, it forces you to learn and concentrate and I find that really awesome. The control scheme is so tight and it is so well-rounded of a game, especially for a mobile title. It’s fantastic and there really is nothing the development team could have done better and that’s the honest truth. Perfect to say the least. The game sounds fantastic, there’s no big music tracks in this game and it actually fits so well, instead you hear the sounds of the horses, the birds, the crowds and, most importantly, the joust itself. 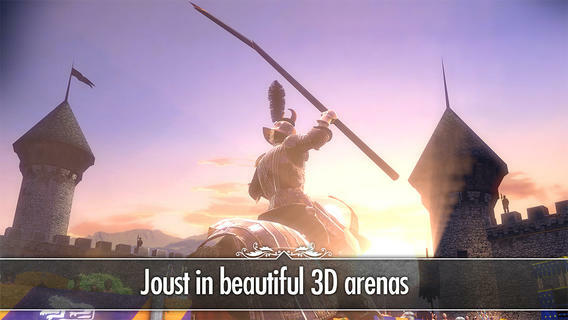 The audio and visuals work together well in the actual joust because it, kind of, gives you an indication of how well you did, for example; if you hear a booming “crack” sound and also see small splinters flying past your character you know that you’ve broken your lance and you’re about to get yourself some big points. I actually hated playing this with the sound off, which I did do a couple of times so not to annoy others, it just doesn’t have the same feel. Immersion is a big part of this game, the audio and visuals really draw you in. The graphics are absolutely fantastic in Joust Legend, down right incredible. Everything is so smooth, the environments look great and it’s actually quite cinematic to be honest, there’s motion blur and mud that gets kicked up. There was no detail left out. This game is so damn well-rounded! Honestly! I haven’t played a better iOS game than this for a very long time. I’m actually quite addicted and I have no obligation to continue playing this game but, my God, I can’t seem to put it down! I’m not a big fan of iOS games and I’m not a big fan of Medieval-style games but Joust Legend has really gotten me “hook, line and sinker”. I don’t even know what else to say to be honest, it’s fantastic and it’s only $1.99 so even if you don’t like it, which I highly doubt, it’s not that big of a loss. This game truly deserves a perfect score and that’s exactly what I’m going to give it. 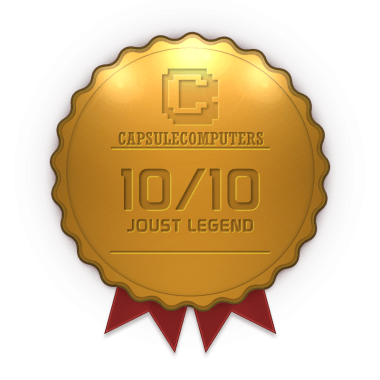 Well done, Joust Legend, well done indeed.